Because frog told him he was ugly, the littlest cricket now longs to be a pretty butterfly — until a spider teaches the cricket that all friends are beautiful. 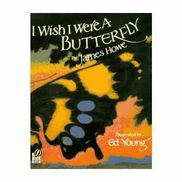 Y5 enjoyed a wonderful book by author James Howe called "I Wish I Were a Butterfly." In this story a cricket is not happy with whom he is. He considers himself very ugly. He wishes that he were a butterfly because he says that there is always beauty in a butterfly. After watching the video, the children worked in groups, retelling and illustrating the different parts of the story. "I Wish I Were a Butterfly" reminds us that we all are unique and have something to learn from each other!